Objective Postoperative ileus (POI), the most frequent complication after intestinal surgery, depends on dendritic cells (DCs) and macrophages. Here, we have investigated the mechanism that activates these cells and the contribution of the intestinal microbiota for POI induction. Design POI was induced by manipulating the intestine of mice, which selectively lack DCs, monocytes or macrophages. The disease severity in the small and large intestine was analysed by determining the distribution of orally applied fluorescein isothiocyanate-dextran and by measuring the excretion time of a retrogradely inserted glass ball. The impact of the microbiota on intestinal peristalsis was evaluated after oral antibiotic treatment. Results We found that Cd11c-Cre+ Irf4flox/flox mice lack CD103+CD11b+ DCs, a DC subset unique to the intestine whose function is poorly understood. Their absence in the intestinal muscularis reduced pathogenic inducible nitric oxide synthase (iNOS) production by monocytes and macrophages and ameliorated POI. Pathogenic iNOS was produced in the jejunum by resident Ly6C– macrophages and infiltrating chemokine receptor 2-dependent Ly6C+ monocytes, but in the colon only by the latter demonstrating differential tolerance mechanisms along the intestinal tract. Consistently, depletion of both cell subsets reduced small intestinal POI, whereas the depletion of Ly6C+ monocytes alone was sufficient to prevent large intestinal POI. The differential role of monocytes and macrophages in small and large intestinal POI suggested a potential role of the intestinal microbiota. Indeed, antibiotic treatment reduced iNOS levels and ameliorated POI. Conclusions Our findings reveal that CD103+CD11b+ DCs and the intestinal microbiome are a prerequisite for the activation of intestinal monocytes and macrophages and for dysregulating intestinal motility in POI. Postoperative ileus (POI) is the most frequent complication after intestinal surgery. The accumulation of dendritic cells and macrophages has been observed in POI. Intestinal macrophages produce inducible nitric oxide synthase (iNOS) that impairs intestinal peristalsis in POI. Intestinal muscularis CD103+CD11b+ DCs depend on the transcription factor Irf4 and initiate POI by stimulating iNOS production in monocytes and macrophages. Infiltrating Ly6C+ monocytes and resident Ly6C– macrophages produce iNOS and cause small intestinal POI, whereas only Ly6C+ monocytes induce large intestinal POI. Antibiotic treatment reduces iNOS and ameliorates POI. Modulating the intestinal microbiota may be a prophylactic strategy against POI. Intestinal phagocytes, such as macrophages and dendritic cells (DCs), are crucial in maintaining gut homeostasis1–3 and in regulating intestinal motility.4–7 Under homeostasis, exposure to the luminal microbiota does not induce proinflammatory responses,5 because these cells possess a tolerogenic signature.8 However, such conditioning is impaired in acute inflammation, so that these cells acquire a proinflammatory signature and induce intestinal diseases.4 8–11 The most frequent adverse condition after intestinal surgery, postoperative ileus (POI), critically depends on the activation of intestinal phagocytes, such as macrophages and DCs.4 9 12 We have previously shown in a murine model of POI that surgical injury to the intestinal tract caused intestinal DCs to locally produce the proinflammatory mediator interleukin-12 (IL-12), which stimulated memory Th1 cells to produce interferon-γ (IFNγ), which in turn activated macrophages to express inducible nitric oxide synthase (iNOS). Its product NO paralyses intestinal muscle cells, resulting in POI.4 9 12 These findings established the molecular cascade linking intestinal DCs that sense local injury and intestinal macrophages that stop peristalsis. However, the identity of the relevant DCs and macrophages, their individual roles in regulating intestinal peristalsis in POI and the signals that regulate their local activation are unclear. Intestinal macrophages and DCs express an overlapping pattern of surface molecules, which often hampers definitive conclusions concerning their specific functions. Intestinal DCs are defined by the expression of CD11c, CD103, major histocompatibility complex (MHC) class II and differential expression of CD11b.13 CD103+CD11b– DCs depend on the transcription factors Batf3 and Irf8.14 15 They cross-present antigen to CD8+ T cells,16 induce regulatory T cells and modulate T cell responses.13 DCs expressing CD11b and CD103 develop from the common Flt3L-dependent pre-cDC progenitor17 18 by mechanisms involving the transcription factors Irf4.19 They are unique to the intestinal tract and have been shown to contribute to intestinal immunity.18 20 21 However, their role in intestinal disease is much less understood than that of the other phagocyte subsets. In contrast to DCs, monocytes and macrophages in the intestine lack CD103 expression and are defined by expression of F4/80, CX3CR1 and CD64.13 22 These cells are further subdivided by Ly6C into Ly6C–CX3CR1high macrophages and Ly6C+CX3CR1low monocytes, which originate from recently recruited Ly6C+ blood monocytes. Some resident Ly6C– macrophages in the liver, the brain and the skin are long-living cells, which are derived from earlier yolk sac and fetal liver progenitors.23–25 They can maintain themselves during life with little contribution of circulating Ly6C+ monocytes.25 26 However, intestinal Ly6C– macrophages have an exceptionally short half-life of 3 weeks27 and are constantly replaced by blood-derived Ly6C+ monocytes.17 18 28 29 Hence, the majority of intestinal monocytes and macrophages represents a continuum of differentiation with an important role in intestinal homeostasis by regulating different functional capabilities in health and disease.7 30 In the present study, we have investigated the different phagocyte subsets in the small and large intestine and their role in POI. We have previously shown that intestinal CD103+CD11b+ DCs produced IL-12 in POI, which stimulated IFNγ production by pathogenic memory Th1 cells.4 To determine the necessity of this DC subset for POI, we used Cd11c-Cre+ Irf4flox/flox (Cd11c-Cre+ ) mice, which have been reported to lack these cells in the mesenteric lymph nodes and partially in the lamina propria.19 We first established that these DCs were also absent from the intestinal muscularis after small intestinal manipulation (SIM) (figure 1A, online supplementary figure 1), whereas the minor population of CD103+CD11b– DCs was unchanged (figure 1B). Importantly, both small (figure 1C,D) and large intestinal POI (figure 1E) were reduced in the absence of CD103+CD11b+ DCs, identifying these DCs as critical inducers of POI. CD103+CD11b+ DCs are reduced in mice lacking Irf4. Flow cytometric analysis of CD11b and CD11c on Hoechst–CD45+MHCII+CD103+ DCs 24 hours after small intestinal manipulation (SIM) in Cd11c-Cre– Irf4flox/flox (Cd11c-cre– , upper row) and Cd11c-Cre+ Irf4flox/flox (Cd11c-cre+ , lower row) mice. The expression of iNOS by intestinal macrophages mediates POI by paralysing intestinal myocytes.4 31 To investigate whether CD103+CD11b+ DCs regulate iNOS production, we first enumerated CD64+F4/80+ cells in the muscularis. We found a strong increase of these cells after SIM, suggesting that some of these cells might originate from recruited monocytes (figure 1F,G). Such increase was not reduced in Cd11c-Cre+ mice, which lack CD103+CD11b+ DCs (figure 1G). Therefore, we hypothesised that CD64+F4/80+ cells were unable to produce pathogenic iNOS. Indeed, iNOS expression by CD64+F4/80+ cells was significantly increased after SIM only in Cd11c-Cre– littermates, but not in Cd11c-Cre+ mice (figure 1H). These data indicate that Irf4-dependent CD103+CD11b+ DCs locally activate muscularis monocytes and macrophages to produce iNOS. Postoperative ileus depends on Irf4-dependent CD103+CD11b+ DCs. (A,B) The number of CD103+CD11b+ (A) and CD103+CD11b– DCs (B), pregated on Hoechst–CD45+CD11c+MHCII+ cells, were determined by flow cytometric analysis 24 hours after small intestinal manipulation (SIM) or sham manipulation in Cd11c-Cre– Irf4flox/flox (Cd11c-Cre– ) and Cd11c-Cre+ Irf4flox/flox (Cd11c-Cre+ ) mice (representative data of SIM n=8, sham n=5). (C–E) Analysis of small intestinal (C–D) and large intestinal motility (E) in Cd11c-Cre+ or Cd11c-Cre– mice 24 hours after SIM (FITC-Dex=Fluorescein isothiocyanate-dextran, S=stomach, 1–10=small intestinal segments, Z=caecum, C1-3=large intestinal segments) (SIM n=8, sham n=4). 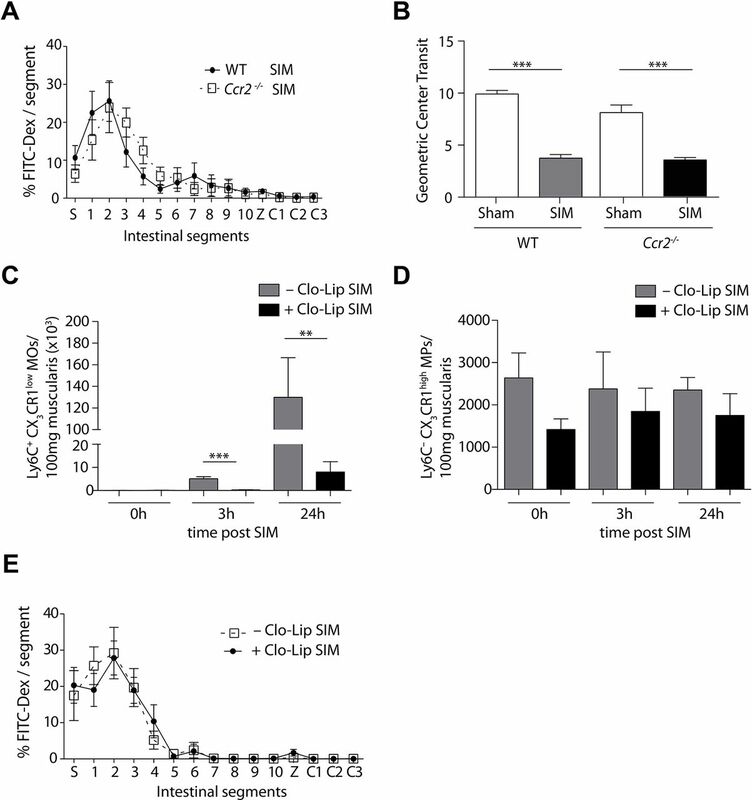 (F) Gating scheme for macrophages in Cd11c-Cre– mice 24 hours after intestinal manipulation. (G) The number of muscularis macrophages (Hoechst–CD45+F4/80+CD64+) in Cd11c-Cre+ or Cd11c-Cre− mice was determined 24 hours after SIM or sham manipulation by flow cytometry (representative data of SIM n=8, sham n=5). (H) CD64+F4/80+ macrophages were isolated by cell sorting 24 hours after SIM or sham. Nos2 (inducible nitric oxide synthase) expression was determined by quantitative PCR and the expression was normalised to Hprt (HPRT) (nd=non-detectable) (n=8 SIM, n=4 sham). Results are given as mean +/-SEM. *p<0.05; **p<0.01;***p<0.001. Distinct monocytes and macrophages differing in Ly6C and CX3CR1 expression have been described in the circulation and in the intestine.8 32 33 We asked whether iNOS-producing monocytes or macrophages mediated POI in the intestinal muscularis. The small intestinal muscularis of sham-manipulated mice mainly harboured Ly6C–CX3CR1high macrophages (figure 2A). SIM induced a significant increase of cells expressing high levels of Ly6C, but low levels of CX3CR1 (Ly6C+CX3CR1low) (figure 2A). These cells expressed low levels of MHC class II on their surface (figure 2B), suggesting that these cells originated from recruited Ly6C+blood monocytes. Notably, all CX3CR1low cells expressed CD64 (online supplementary figure 2, middle histogram), indicating that the recently described lamina propria CD64–CD103–CX3CR1low DCs20 21 are not present in the manipulated muscularis. Given that CCR2 is crucial for the abundance of Ly6C+ blood monocytes, the direct progenitor of Ly6C+ monocytes in the muscularis,32 we hypothesised that CCR2 mediates the increase of these cells in POI. To facilitate detection of Ly6C+CX3CR1low monocytes also in mice lacking CCR2, we generated Ccr2–/– Cx3cr1GFP mice. We found that the abundance of Ly6C+ monocytes but not of Ly6C– macrophages was severely decreased after SIM of Ccr2–/– Cx3cr1GFP mice (figure 2C). 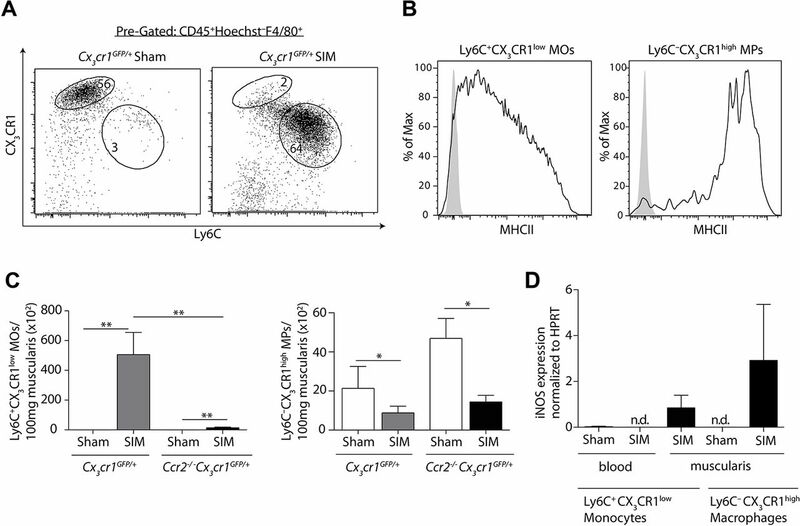 These data demonstrate that the increased abundance of Ly6C+ monocytes within the manipulated muscularis depends on the recruitment of CCR2-dependent Ly6C+blood monocytes. CD64 expression on Ly6C–CX3CR1high (upper histogram), Ly6C+CX3CR1low (middle histogram) and CX3CR1neg leucocytes (lower histogram). Flow cytometric analysis of CD64 on CD45+ muscularis cells 24 hours after SIM. The solid line represents the CD64 expression, whereas the grey area indicates the isotype control. We next asked whether Ly6C+ monocytes and/or Ly6C– macrophages produced pathogenic iNOS in POI. We first examined the progenitors of Ly6C+ muscularis monocytes, namely Ly6C+ blood monocytes. However, we were unable to detect iNOS expression in blood monocytes of manipulated or sham-operated mice (figure 2D). In contrast, Ly6C+ monocytes as well as Ly6C– macrophages within the small intestinal muscularis upregulated iNOS after SIM, indicating their local activation (figure 2D). The abundance of inducible nitric oxide synthase (iNOS)-producing Ly6C+ monocytes depends on CCR2. (A) Small intestinal muscularis monocytes (MOs) and macrophages (MPs), pregated on Hoechst–CD45+F4/80+ cells, were analysed for their expression of CX3CR1 and Ly6C 24 hours after small intestinal manipulation (SIM) by flow cytometry. (B) Flow cytometric analysis of major histocompatibility complex (MHC) class II expression on Ly6C+CX3CR1low monocytes (left) and Ly6C–CX3CR1high macrophages (right), pregated on live/dead–CD45+F4/80+, in the muscularis 24 hours after SIM. The solid line represents the MHC class II expression, whereas the grey area indicates control staining (Fluorescence Minus One) (representative data of n=6). (C) The number of Ly6C+CX3CR1low monocytes (left bar graph) and Ly6C–CX3CR1high macrophages (right bar graph) were determined in the muscularis 24 hours after SIM or sham in Cx3cr1GFP/+ and Cx3cr1GFP/+ Ccr2−/− mice (representative data of n=8). (D) Ly6C+CX3CR1low monocytes and Ly6C–CX3CR1high macrophages from the small intestinal muscularis and from the blood were isolated by cell sorting 24 hours after SIM or sham. Nos2 (iNOS) expression was determined by quantitative PCR and the expression was normalised to Hprt (HPRT) (representative data of blood n=8, muscularis n=8) (nd = not detectable). Results are given as mean +/− SEM. *p<0.05; **p<0.01. Next, we analysed the requirement of these iNOS-producing Ly6C– macrophages and Ly6C+ monocytes for POI by selective targeting. To target Ly6C+ monocytes, we again employed Ccr2–/– mice and found that these mice were not protected from small intestinal POI (figure 3A,B). To confirm these data, we conditionally depleted Ly6C+ monocytes by clodronate liposomes. We found a strong reduction of Ly6C+ monocytes, whereas the number of Ly6C– macrophages and CD103+CD11b+ DCs was not reduced at various time points after depletion (figure 3C,D, online supplementary figure 3). However, depletion of Ly6C+ monocytes did not reduce POI (figure 3E), confirming the findings in CCR2-deficient animals (figure 3A,B). Abundance of CD103+CD11b+ DCs in Cx3cr1-Cre+ iDtrflox/+ mice after application of diphtheria toxin. Number of small intestinal CD103+CD11b+ DCs (pregated Hoechst–CD45+MHCII+CD11c+) in Cx3cr1-Cre+ iDtrflox/+ (BM-iDTR) and C57Bl/6 (BM-WT) bone marrow chimeras after treatment with clodronate liposomes (CloLip) or diphtheria toxin (DT) (representative data of n=8). Results are given as mean +/− SEM.**p<0.01. Selective depletion of Ly6C+ monocytes does not ameliorate small intestinal POI. (A,B) Measurement of small intestinal motility 24 hours after small intestinal manipulation (SIM) or sham manipulation in Ccr2−/− or C57Bl/6 (WT) mice (representative data of SIM, n=8, sham n=5) (FITC-Dex=Fluorescein isothiocyanate-dextran, S=stomach, 1–10=jejunal segments, Z=caecum, C1-3=colonic segments). (C,D) Flow cytometric analysis of Ly6C+CX3CR1low monocytes (MOs) (C) or Ly6C–CX3CR1high macrophages (MPs) (D), pregated on Hoechst–CD45+F4/80+ cells, in the small intestine of Cx3cr1GFP/+ mice. Mice were treated with clodronate liposome (CloLip) 12 hours before SIM and the number of cells was analysed 3 and 24 hours after SIM and in unmanipulated mice (0 hours) (representative data of n=3–6). (E) One day after SIM, FITC-dextran transit was analysed in CloLip-treated C57Bl/6 mice (n=9) (FITC-Dex=fluorescein isothiocyanate-dextran, S=stomach, 1–10=equal small intestinal segments, Z=caecum, C1-3=equal large intestinal segments). Results are given as mean +/− SEM. *p<0.05; **p<0.01; ***p<0.001. Next, we hypothesised that iNOS by Ly6C– macrophages are crucial for POI induction. As these cells are targeted neither by CCR2 nor clodronate (figures 2C and 3D), we employed Cx3cr1-Cre+ iDtrflox/+ mice based on their high CX3CR1 expression. In contrast to Ly6C–CX3CR1high macrophages in the intestine, this macrophage subset in other organs, such as microglia in the central nervous system (CNS), are radioresistant.24 To avoid depletion of these radioresistant microglia in the CNS, we generated bone marrow chimeric mice to avoid neurological side effects by the depletion of microglia in the CNS. Hence, C57BL/6 recipient mice were engrafted with bone marrow of Cx3cr1-Cre+ iDtrflox/+ mice. 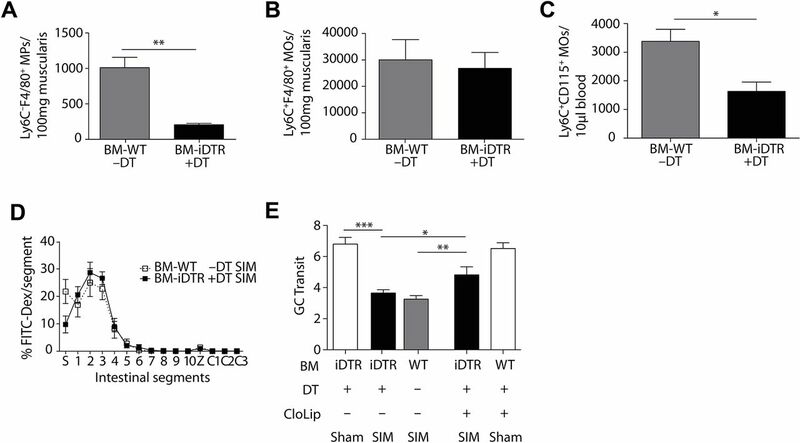 We found a reduction of Ly6C– macrophages within the muscularis after administration of diphtheria toxin (DT) into Cx3cr1-Cre+ iDtrflox/+ mice (BM-iDTR) (figure 4A), whereas the number of Ly6C+ monocytes in the muscularis was not changed (figure 4B). Notably, we found a slight reduction of Ly6C+ blood monocytes and of CD103+CD11b+ DCs (figure 4C and online supplementary figure 3). However, depleting Ly6C– macrophages in BM-iDTR mice did not ameliorate small intestinal POI (figure 4D,E). Hence, we speculated that the lack of Ly6C– macrophages might be compensated by Ly6C+ monocytes and vice versa. We therefore combined the depletion of Ly6C– macrophages in chimeric BM-iDTR mice with the conditional depletion of Ly6C+ monocytes by clodronate liposomes. Indeed, depletion of both Ly6C+ monocytes and Ly6C– macrophages markedly reduced POI (figure 4E), confirming that these iNOS-producing cells are sufficient to induce POI within the small intestine. Small intestinal postoperative ileus is induced by Ly6C+ monocytes or Ly6C– macrophages. (A–C) Abundance of Ly6C–F4/80+ macrophages (MPs) (A), Ly6C+F4/80+ monocytes (B) and Ly6C+CD115+ monocytes (C) after sham (A) or small intestinal manipulation (SIM) in the small intestinal muscularis (B) or in the blood (C) of Cx3cr1-Cre+ iDtrflox/+ (BM-iDTR) or C57Bl/6 (BM-WT) bone marrow chimeras treated with diphtheria toxin (+DT) or left untreated (–DT) (representative data of n=7). (D,E) Measurement of small intestinal motility 24 hours after SIM or sham in Cx3cr1-Cre+ iDtrflox/+ (BM-iDTR) or C57Bl/6 (BM-WT) mice (SIM n=11, SIM DT and CloLip n=7, sham n=4) (FITC-Dex=Fluorescein isothiocyanate-dextran, S=stomach, 1–10=small intestinal segments, Z=caecum, C1-3=large intestinal segments). GC=geometric centre; CloLip=clodronate liposomes. Results are given as mean +/− SEM. *p<0.05; **p<0.01; ***p<0.001. We have shown previously and in figure 1 that small intestinal POI can spread to non-manipulated large intestinal segments.4 12 Hence, we next investigated the role of Ly6C– macrophages and Ly6C+ monocytes in inducing colonic POI. We found a profound influx of Ly6C+ monocytes into the large intestinal muscularis after SIM (figure 5A). Ly6C+ monocytes expressed low levels of MHC class II on their surface in comparison to Ly6C– macrophages (figure 5B). The increase of Ly6C+ monocytes in the colonic muscularis was dependent on CCR2 (figure 5C), suggesting that these cells originated from Ly6C+blood monocytes. In contrast, the number of Ly6C– macrophages was unaffected by the lack of this chemokine receptor (figure 5D). To investigate the role of Ly6C+ monocytes in inducing large intestinal POI, we employed CCR2-deficient animals. In contrast to the small intestine, the selective lack of Ly6C+ monocytes in CCR2-deficient animals strongly reduced large intestinal POI (figure 5E). Moreover, conditional depletion of Ly6C+ monocytes by clodronate liposomes also reduced POI (online supplementary figure 4A,B). Notably, the number of Ly6C– macrophages was not reduced (online supplementary figure 4C). These data demonstrate that recruited Ly6C+ monocytes are essential for colonic POI, implying that Ly6C– macrophages are dispensable. Large intestinal motility is improved in mice lacking Ly6C+CX3CR1low monocytes. (A) C57Bl/6 mice were treated with clodronate liposomes (CloLip) 12 hours before SIM. Large intestinal motility was determined 24 hours after SIM (n=8). (B,C) Flow cytometric analysis of Ly6C+CX3CR1low monocytes (MOs) (B) or Ly6C–CX3CR1high macrophages (MPs) (C), pregated on Hoechst–CD45+F4/80+ cells, in Cx3cr1GFP/+ mice. Mice were treated with clodronate liposome (CloLip) 12 hours before SIM and the number of cells was analysed 3 and 24 hours after SIM and in unmanipulated mice (0 hour) (representative data of n=3–6). Results are given as mean +/− SEM. *p<0.05; **p<0.01. Large intestinal postoperative ileus depends on Ly6C+ monocytes. (A) Flow cytometric analysis of large intestinal muscularis monocytes (MOs) and macrophages (MPs), pregated on Hoechst–CD45+F4/80+ cells, 24 hours after small intestinal manipulation (SIM) in Cx3cr1GFP/+ mice. (B) Flow cytometric analysis of MHC class II expression on Ly6C+CX3CR1low monocytes (left) and Ly6C–CX3CR1high macrophages (right), pregated on live/dead–CD45+F4/80+ cells, in muscularis 24 hours after SIM. The solid line represents the major histocompatibility complex (MHC) class II expression, whereas the grey area indicates control staining (Fluorescence Minus One) (representative data of n=6). 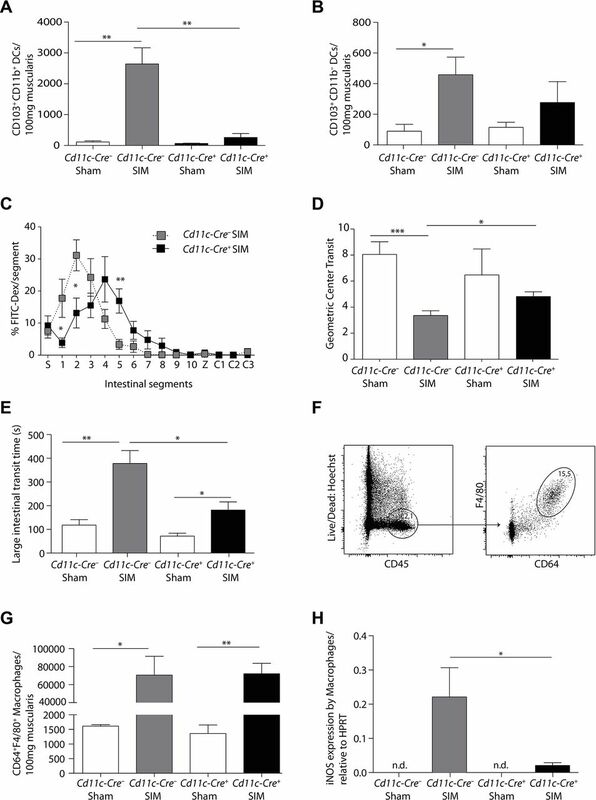 (C,D) Numerical analysis of Ly6C+ monocytes (C) and Ly6C– macrophages (D) in large intestinal muscularis 24 hours after SIM in Cx3cr1GFP/+ and Ccr2−/− Cx3cr1GFP/+ mice (representative data of n=8). (E) Large intestinal motility in Ccr2−/− and C57Bl/6 (WT) mice 24 hours after SIM (SIM n=26, sham n=5). (F) Large intestinal transit 24 hours after sham or large intestinal manipulation (LIM) of Ccr2−/− and C57Bl/6 (WT) mice (LIM n=8, WT LIM n=9, sham n=5). (G,H) Large intestinal Ly6C+CX3CR1low monocytes and Ly6C–CX3CR1high macrophages, pregated on Hoechst–CD45+F4/80+cells, were isolated from Cx3cr1GFP/+ mice by cell sorting 24 hours after either LIM (G) or SIM (H) and Nos2 (inducible nitric oxide synthase) expression was determined by quantitative-PCR. Expression was normalised to Hprt (HPRT) (nd=non-detectable) (representative data of n=8). (I) The number of CD103+CD11b+dendritic cells, pregated on Hoechst–CD45+CD11c+MHCII+ cells, were determined by flow cytometric analysis in small and large intestinal muscularis 24 hours after sham or SIM (representative data of SIM n=4, sham n=3). Results are given as mean +/− SEM. *p<0.05; **p<0.01. Next, we wished to clarify why CCR2 deficiency after SIM selectively protected against large intestinal, but not against small intestinal POI. We first hypothesised that this discrepancy occurred, because we had manipulated the small intestine, reasoning that this might have provided additional stimuli, such as the release of Damage Associated Molecular Patterns (DAMPs), which enabled local phagocyte activation in the manipulated small intestine, but not in the distant colon. To test this hypothesis, we changed the site of manipulation and manipulated the large intestine of CCR2-deficient animals. However, the large intestine of CCR2-deficient mice was still protected against POI (figure 5F). Consistently, iNOS was only produced by large intestinal Ly6C+ monocytes but not by Ly6C– macrophages (figure 5G,H). Thus, the site of intestinal manipulation did not decide whether Ly6C– macrophages produced iNOS and caused POI, implying that other mechanisms prevented colonic macrophages from iNOS production. Given that CD103+CD11b+ DCs initiate iNOS production by macrophages (figure 1), we analysed the presence of these cells after manipulation. We found that these cells are absent in the colon (figure 5I), suggesting that the presence of CD103+CD11b+ DCs might be required for iNOS production by Ly6C– macrophages. Another difference between the small and large intestine is the composition and quantity of the microbiota.34 35 To investigate the role of the microbiota for the activation of CD103+CD11b+ DCs, monocytes and macrophages, and the induction of POI, we depleted the microbiota by antibiotics (online supplementary figure 5). We noted a considerable reduction of IL-12 (figure 6A) and iNOS (figure 6B), suggesting that the activation of DCs, monocytes and macrophages depends on the microbiota. Notably, RNA and protein analyses revealed a strong reduction of IFNγ (figure 6C,D), suggesting that the previously described Th1 response was inhibited.4 We found that mice treated with antibiotics showed a moderate reduction in small intestinal POI (figure 6E,F). However, antibiotic treatment also reduced intestinal peristalsis in sham-operated animals (figure 6F). In the colon, POI was strongly reduced after antibiotic treatment (figure 6G), demonstrating the essential role of the microbiota for POI induction. Efficient bacterial depletion after treating animals for 6 days with antibiotics. (A) Columbia blood agar culture from supernatant of homogenised faeces from mice treated with antibiotics for 6 days (+Antibiotics). The control littermates received only water (–Antibiotics). The images are representative for n=8 (+Antibiotics) and n=10 (–Antibiotics) animals. (B) Amount of bacterial 16S rDNA (ng rDNA per mg faeces) in faecal pellets from C57BL/6 mice receiving antibiotics in the drinking water for 6 and 13 days (–Antibiotics n=4, +Antibiotics n=4). The amount of bacterial 16S rDNA was determined by qantitative-PCR with absolute quantification. Two different universal primer pairs for 16S rDNA verified the results (8F primer right graph (forward: CGG CAA CGA GCG CAA CCC; reverse: CCA TTG TAG CAC GTG TGT AGC C), 16SF16 primer left graph (forward: AGA GTT TGA TCC TGG CTC AG; reverse: ACG GCT ACC TTG TTA CGA CTT)). Results are given as mean +/− SEM. *p<0.05; ***p<0.001. Postoperative ileus depends on the intestinal microbiota. (A–D) The small intestinal muscularis of untreated (–Antibiotics) and antibiotic-treated (+Antibiotics) mice was isolated 24 hours after small intestinal manipulation (SIM). Il12a, Nos2 (iNOS) and Ifng (IFNγ) RNA (A–C) or IFNγ protein (D) expression was analysed by quantitative-PCR (A–C) or ELISA (D) (–Antibiotics SIM n=7 (A) n=4 (B–D), +Antibiotics SIM n=8). (E,F) Measurement of small intestinal motility 24 hours after SIM or sham manipulation (sham) in antibiotic-treated and untreated mice (–Antibiotics sham n=5, –Antibiotics SIM n=18, +Antibiotics sham n=7, +Antibiotics SIM n=22) (FITC-Dex=Fluorescein isothiocyanate-dextran, S=stomach, 1–10=jejunal segments, Z=caecum, C1-3=colonic segments). (G) The large intestinal motility of antibiotic-treated or untreated mice was measured 24 hours after SIM or sham manipulation (sham) (–Antibiotics sham n=5, –Antibiotics SIM n=11, +Antibiotics sham n=7, +Antibiotics SIM n=15). Results are given as mean +/− SEM. *p<0.05; **p<0.01; ***p<0.001. Macrophages and DCs play central roles in intestinal immunity,13 36 in the regulation of intestinal peristalsis and in POI.4 5 9 In the present study, we have identified the intestinal microbiota and Irf4-dependent CD103+CD11b+ DCs as crucial regulators of monocyte and macrophage responses in POI. Two subsets of intestinal CD103+ DCs with differential expression of CD11b have been defined previously.37 CD103+CD11b– DCs depend on the transcription factors Batf3 and Irf8,14 15 whereas CD103+CD11b+ DCs depend on the transcription factor Irf4.19 38 Consistent with these previous findings, we found that CD103+CD11b+ DCs in the intestinal muscularis depend on Irf4. Lack of these DCs in Cd11c-Cre+ Irf4flox/flox mice ameliorated POI and reduced iNOS production by intestinal macrophages. As iNOS expression depended on IFNγ by Th1 memory cells,4 Irf4-dependent CD103+CD11b+ DCs may be directly involved in the Th1 response and subsequent macrophage activation resulting in POI. These findings identify a novel role of this enigmatic intestinal DC subset in a disease model. Macrophages are considered crucial in the regulation of intestinal peristalsis5 and in POI.4 9 In particular, iNOS production by these cells has been shown to induce POI by directly inhibiting smooth muscle cells.4 9 31 We found a strong CCR2-dependent increase of Ly6C+ monocytes in the intestine consistent with previous studies in other inflammatory models.8 17 39 These cells resemble recruited Ly6C+ blood monocytes, which can locally be activated to produce proinflammatory mediators.8 10 40 Also in POI, they underwent a functional switch from iNOS-negative blood monocytes to iNOS-producing monocytes in the manipulated intestinal muscularis. These data suggest that local tolerance mechanisms are disabled in POI. Notably, the expression of MHC class II on Ly6C+ monocytes in the small intestine exceeded the expression in the colon, which might be due to signals derived from the local manipulation of the small intestine. Targeting Ly6C+ monocytes has been suggested for disease management of several inflammatory disorders.10 41 We aimed at achieving a beneficial effect in the initial phase after POI induction by reducing the abundance of recruited iNOS-producing Ly6C+ monocytes. However, lack of these cells in CCR2-deficient mice or their conditional depletion through clodronate liposomes only ameliorated large intestinal, but not small intestinal POI. These findings do not exclude a role of these cells during the resolution phase after POI induction. Further studies are required to delineate the role of muscularis macrophages in tissue repair. The finding that depletion of Ly6C+ monocytes did not ameliorate small intestinal POI suggested compensatory mechanisms. Indeed, we found that Ly6C– macrophages in the small intestine were also able to produce iNOS after intestinal manipulation, thereby compensating for the lack of Ly6C+ monocytes. In contrast, Ly6C– macrophages in the colon failed to produce iNOS, indicating a differential and tolerant functional state. 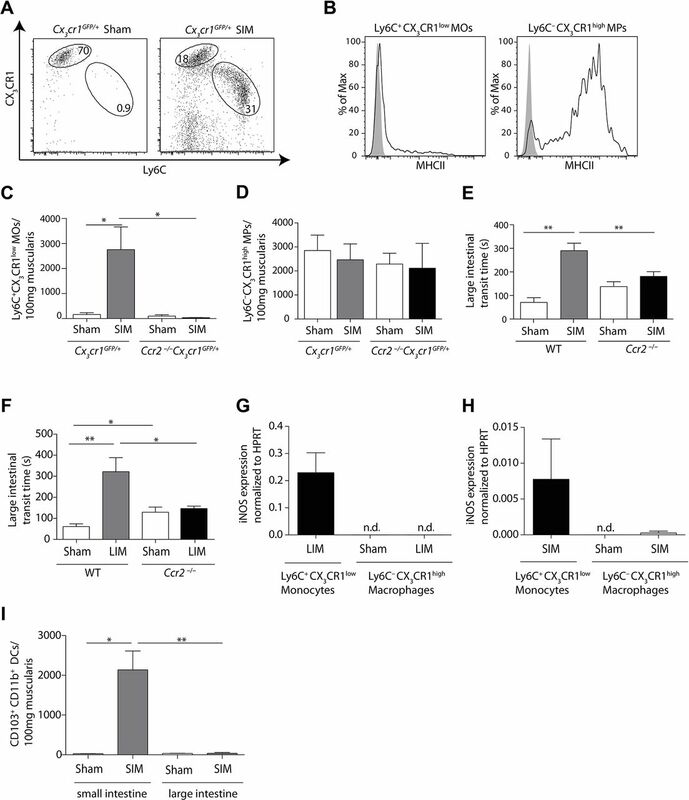 This finding was corroborated by recent studies demonstrating that Ly6C– macrophages in the colonic intestinal mucosa retain their tolerant and non-inflammatory signature even under inflammatory conditions.8 10 A plausible mechanism that prevents colonic Ly6C– macrophages to produce iNOS is the compositional and quantitative differences between the microbiota in the small intestine and the colon.34 35 The constant exposure to the abundant colonic microbiota inhibits iNOS production by Ly6C– macrophages, in order to avoid inappropriate responses against commensals, also in the context of POI. Another explanation is the regional distribution of CD103+CD11b+ DCs along the intestine. Consistent with previous findings,42 we found that the colonic muscularis hardly harboured CD103+CD11b+ DCs, suggesting that their absence in the colonic muscularis might be causative for the lack of iNOS expression by Ly6C– macrophages. To analyse the role of Ly6C– macrophages in small intestinal POI, we designed a conditional deletion approach in bone marrow chimeric mice, by reconstituting lethally irradiated mice with bone marrow from Cx3cr1-Cre+ iDtrflox/+ mice (BM-iDTR). Application of DT into these mice depleted Ly6C– macrophages. Notably, we also found a slight reduction of CD103+CD11b+ DCs, which was less pronounced than in the transgenic Cd11c-Cre+ Irf4flox/flox mice. The application of DT was insufficient to reduce POI, suggesting that both, iNOS produced by Ly6C+ monocytes and Ly6C– macrophages, might be sufficient to trigger POI. To test for this possibility, we combined the DT-dependent deletion of Ly6C– macrophages with the conditional deletion of Ly6C+ monocytes by clodronate liposomes. And indeed, the loss of both cell subsets attenuated POI, verifying compensatory roles of Ly6C– macrophages and Ly6C+ monocytes in small intestinal POI. We next asked whether iNOS production by monocytes and macrophages is regulated by CD103+CD11b+ DCs and by the intestinal microbiota. We found that iNOS production by monocytes and macrophages was severely reduced in the absence of CD103+CD11b+ DCs. This correlative finding does not indicate a direct interaction between these cells, and as described previously other leucocytes are involved in this signalling cascade.4 The activation of CD103+CD11b+ DCs and the attenuation of POI in the absence of these cells raised the question which mechanism activated these DCs. Translocation of microbial products into the intestinal tissue is a well-documented feature in POI43 44 and MyD88-dependent sensing of microbial products induces IL-12 production by DCs.45 46 In support of this hypothesis, POI has explicitly been shown to be attenuated in mice lacking Toll-like receptor signalling,45 a prerequisite for microbial sensing. As CD103+CD11b+ DCs abundantly express Toll-like receptors,46 47 sensing the microbiota, for example, by TLR4 or 5 may activate these DCs and induce POI. Our results do not prove that CD103+CD11b+ DCs directly sense the microbiome. It is also possible that another cell senses the microbiome and then stimulates CD103+CD11b+ DCs to produce IL-12, the mediator that starts the inflammatory cascade leading to POI.4 Answering this question might be possible with the use of mice in which only CD103+CD11b+ DCs lack MyD88. Generating these mice would require discovering a promoter specific for CD103+CD11b+ DCs. Our present findings identify novel players in POI and thereby open new therapeutic opportunities. While inhibiting pathogenic players like IL-12 or iNOS might result in immunosuppressive side effects, modifying the microbiome in the intestine might represent a promising prophylaxis against POI through preventing the activation of CD103+CD11b+ DCs. Further studies are required to correlate the composition of the microbiota with the development of POI. Analysing the composition of the microbiota by sequencing the microbiome may indicate prognostic markers to identify patients of risk. In conclusion, our study reveals a novel role of Irf4-dependent CD103+CD11b+ DCs in the intestine and differential requirements of monocytes and macrophages in the regulation of peristalsis along the gastrointestinal tract. We suggest that modifying the microbiome may be a promising prophylaxis against POI, as it might avoid inappropriate activation of CD103+CD11b+ DCs. Future studies are required to explore the clinical potential of this approach. Mice had been backcrossed >10 generations to C57BL/6 and were used at 8–14 weeks of age. Animals were bred and maintained under specific pathogen-free (SPF) conditions at the animal facilities of the University Clinic of Bonn and Essen. Eight hours after lethal irradiation (9Gy) of 6-week-old CD45.1mice, 5*10(6) bone marrow cells were injected into the tail vein of recipient animals. Experiments were performed 8 weeks after bone marrow transfer. Ccr2−/− Cx3cr1GFP/+ were generated by crossing of Ccr2−/− 48 with Cx3cr1GFP/GFP mice.49 Cd11c-Cre+ Irf4flox/flox mice were kindly provided by William Agace19 and bred to Cd11c-Cre– Irf4flox/flox mice. Germline deletion was tested as described previously.19 Cd11c-Cre+ Irf4flox/flox and Cd11c-Cre– Irf4flox/flox offspring as respective controls were used for experiments. Although loss of CD103+CD11b+ DCs does not alter commensal microbial communities,50 Cd11c-Cre+ Irf4flox/flox and Cd11c-Cre– Irf4flox/flox mice were cohoused to prevent the development of a different microbiota. Bone marrow chimeras were generated by lethally irradiating CD45.1 mice and reconstitution with Cx3cr1-Cre+ iDtrflox/+ bone marrow, which was kindly provided by Steffen Jung, Rehovot, Israel. We performed standardised intestinal manipulation of the small or the large intestine as previously described.4 Briefly, after isoflurane narcosis, the peritoneal cavity was opened by a midline incision, and the jejunum or the colon was placed onto sterile moist gauze and manipulated by moist cotton applicators once from the oral to aboral direction. Then, two layers of running suture closed the laparotomy. Sham-operated mice underwent laparotomy without manipulation. Antibiotic treatment was performed as previously described.5 Shortly, mice were treated for 1–5 weeks before intestinal manipulation with drinking water containing 1 g/L of streptomycin, metronidazole, vancomycin and ampicillin. Water bottles were protected from light and drinking solution was exchanged every 4 days. We separated the muscularis from the mucosa by slipping 10 cm length sections from the intestine or colon over a glass rod and stripped the muscularis using cotton applicators. We cut the muscularis into 5 cm segments and digested these for 45 min at 37°C with 100 U/mL collagenase type VIII and 50 U/mL DNase I in RPMI containing 10% fetal calf serum (FCS) and 0.1% sodium azide. Then samples were homogenised by vigorously pipetting up and down 10 times using 1000 µL tips; afterwards supernatants were passed through a 100 µm nylon mesh. We used the following monoclonal antibody clones: CD103 (PE, M290, BD); CD45 (APC-Cy7, APC and FITC, 30-F11, BD); F4/80 (PE-Cy7, BM8, BioLegend); CD11c (BV421 and BV605, N418, BioLegend); CD64 (PE, X54-5/7.1, BioLegend); MHC class II (APC and PE-Cy7, M5/114.15.2, BioLegend); Ly6C (PerCP-Cy5.5, AL-21, BD); and CD11b (APC and PE, M1/70, BD). Unspecific Fc receptor binding was blocked using human immune globulin, 10% liquid (Privigen) diluted 1:66. We determined absolute cell numbers by adding fixed numbers of CaliBRITE APC-beads (6 µm) (BD Biosciences) before measurement as internal reference, excluding dead cells with Hoechst-33258 (Invitrogen). Additionally, muscularis was weighed before digestion and cell numbers were normalised to 100 mg muscularis. Flow cytometry was performed on a BD LSRFortessa II (cytometer configuration is listed on https://cores.ukb.uni-bonn.de/fccf/wp-content/uploads/sites/11/2017/05/Filter-und-Fluorochrome-Fortessa-BUV.pdf) and data were analysed with Flow-Jo software (Tristar). Experiments including fluorescence activated cell sorting were performed on a BD Aria with a 70 µm nozzle (configuration: https://cores.ukb.uni-bonn.de/fccf/wp-content/uploads/sites/11/2017/02/Filter-und-Fluorochrome-Aria.pdf). ELISA on muscularis homogenate was performed as described previously.4 Shortly, purified muscularis was homogenised in phosphate-buffered saline (PBS) solution containing Roche protease inhibitor and supernatant of centrifuged homogenate was analysed on either IFNγ or IL-12p70 ELISA (DuoSet, eBioscience, Heidelberg, Germany). All reagents, if not otherwise specified, were from Applied Biosystems. Cells for flow cytometric cell sorting were prepared as described above and RNA was extracted using NucleoSpin RNA XS kit (Macherey Nagel). Cells were directly sorted into the supplied lysis buffer RA1. RNA extraction was performed according to the supplier’s instructions. RNA was eluted in 10 µL RNAse-free water and directly transcribed into cDNA with the High Capacity Reverse Transcription kit according to manufacturer’s description. For whole tissue analysis purified muscularis was snap-frozen in liquid nitrogen and extracted using NucleoSpin RNA II kit according to manufacturer’s description. High-capacity cDNA kit was used for reverse transcription according to manufacturer’s description. Qiagen supplied QuantiTect Nos2 primer, primers (5’-TCATTGAATGCTTGGCGCTG-3’, 5’- AGGAACTGGCAAAAGGATGGT-3’) were used for Ifnγ, Hprt (5’- GTCCCAGCGTCGTGATTAGCGAT-3’, 5’-GGGCCACAATGTGATGGCCTCC-3’) was used as a standard. PCR was performed on a Roche LightCycler using SYBR Green Master Mix according to manufacturer’s description. Dissociation of the PCR products by a melting curve analysis was used to exclude samples showing multiple or aberrant melting peaks. Clodronate liposomes were obtained from www.clodronateliposomes.org and 200 µL were applied intravenously 12 hours before manipulation, at the time point of manipulation and 6 hours after manipulation if not indicated otherwise. 10 ng DT (Sigma Aldrich, Germany) per gram mouse was applied intravenously 12 hours before manipulation and at the time point of manipulation. Appropriate assumptions of data (eg, normal distribution or similar variation between experimental groups) were examined before statistical tests were conducted. The sample size was analysed by G*Power analysis to ensure adequate power to detect a prespecified effect size. The number of experiments and the amount of mice per group are given in the legends to the figures. Student’s t-tests were used whenever two groups were compared, and one-way and two-way analyses of variance were done wherever necessary to determine significance for all other data. In all experiments, statistical significance was determined between the groups, which underwent SIM. Results are given as mean±SEM; *p<0.05; **p<0.01; ***p<0.001. The authors acknowledge support from the Central Animal Facilities of the Medical Faculty Bonn and Essen and Lars Franken at Ayoxxa for measuring proteins in low volume samples. We also acknowledge the Imaging Core Facility in Essen (IMCES) and the flow cytometry Core Facility in Bonn.
. Pathogenesis of paralytic ileus: intestinal manipulation opens a transient pathway between the intestinal lumen and the leukocytic infiltrate of the jejunal muscularis. Ann Surg 2002;235:31–40. Vilz TO , et al. Contributors DRE and CK conceived and supervised the study and wrote the manuscript. SG, JMP, CK and DRE designed the experiments. JMP, SG, ST and JKV performed the experiments. WWA, SJ, MG, LKH and DZ provided crucial ideas and reagents and discussed the data. All authors discussed and interpreted the results. Funding This work was supported by grants from the Deutsche Forschungsgemeinschaft to DRE and CK (EN984/1-1, EN984/5-1, EN984/6-1 and SFBTR57), Mercur (An-2015-0066), the Marga und Walter-Boll Stiftung, EU Consortium RELENT and intramural research funds from the Medical Faculty of the University Duisburg-Essen (IFORES to DRE). CK is a member of the Excellence Cluster ImmunoSensation in Bonn. Ethics approval All procedures involving mice were approved by the governmental review board (Bezirksregierung Köln, Landesamt für Natur, Umwelt und Verbraucherschutz NRW in Recklinghausen, Germany). Correction notice This article has been corrected since it published Online First. The last two author positions have been corrected.